Source: This post first appeared on Schooner Martha Foundation here. Spring has finally arrived and with it warm temps and Westerly winds. Friday, Team MARTHA raced the final Whitecap series race, we saw westerly winds from 11 to 18 and it was great race. MARTHA took line honors and corrected to third for the night. In the final series standings MARTHA places second place behind a very well sailed SPARKLE. Cudos to the Team MARTHA youth crew! We are now preparing for Swiftsure and I for one am happy to see warmer temps being forecast! There are now 174 yachts registered to compete, the start will be a magnificent display of sailing yachts of all types. MARTHA departs Point Hudson Thursday the 25th bound for Victoria BC, the Saturday/ Sunday Race will take us out the Straits, around the” Swiftsure Bank,” marked by an anchored Canadian Navel Vessel,” and back to Victoria for the finish, 136.2 miles! You can keep and eye on us by using the Swiftsure Race Tracker, http://tracker.swiftsure.org . For other info you can check things out at http://www.swiftsure.org. 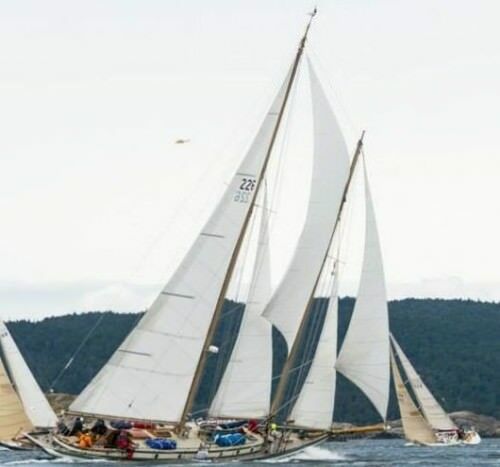 Once back in Port Townsend Monday evening, we will then set our sights on the Classic Mariners Regatta June 3rd & 4th.